Growing rhubarb in your garden provides you with an easy to grow perennial that makes the most wonderful piquant recipes. It freezes well too. We have a clump of rhubarb in our garden my mom gave us. This lovely, edible perennial is worth growing. Once established rhubarb will return year after year with relatively little care. Early each spring it will send up bright red stalks covered in large green leaves bringing in spring colors and delighting the palate with is tangy, sweet desserts, muffins and savory dishes! 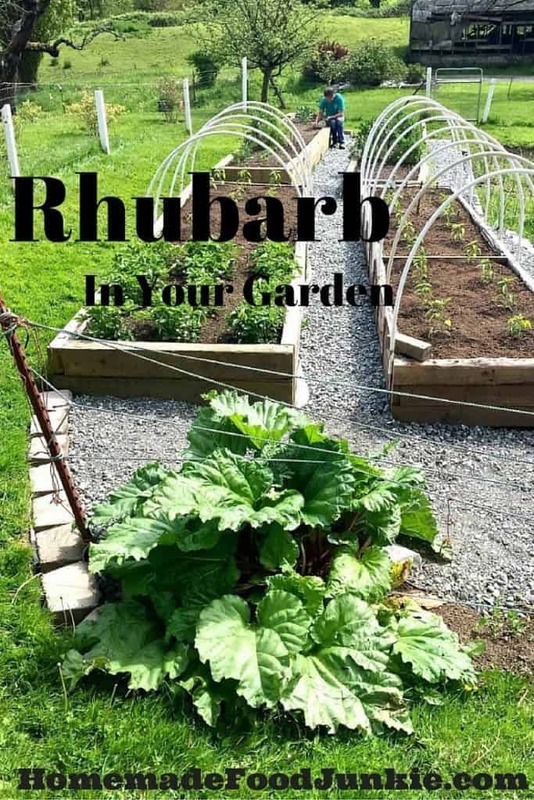 Growing rhubarb in your garden. Rhubarb in our early spring garden. Dave is planting seeds into our raised Garden beds. The bush in the foreground is our three year old rhubarb plant in spring 2015. Welcome Back to our Tuesday in the Garden Blog Hop! 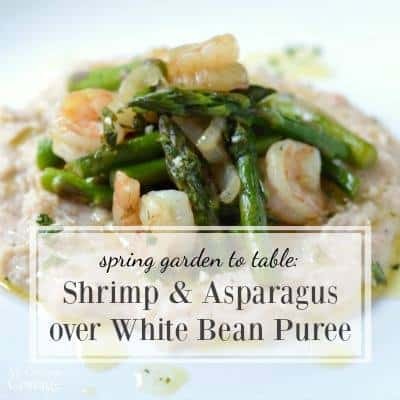 Join us as we share spring recipes, and some tips on how we grow our favorite spring veggies! At the bottom of the post you will find links to all of the members of our Blog hop. Please Click on every post link in the group. You Don’t want to miss a post from these experienced gardeners! Rhubarb, grown in a hill, makes a large leafy mound with upright stalks ready to be picked. Rhubarb loves growing in our U.S.D.A. zone 8a climate. Wet and temperate areas are usually a very good environment for this large, leafy, perennial vegetable. Rhubarb needs a permanent home with lots of room so plan ahead! 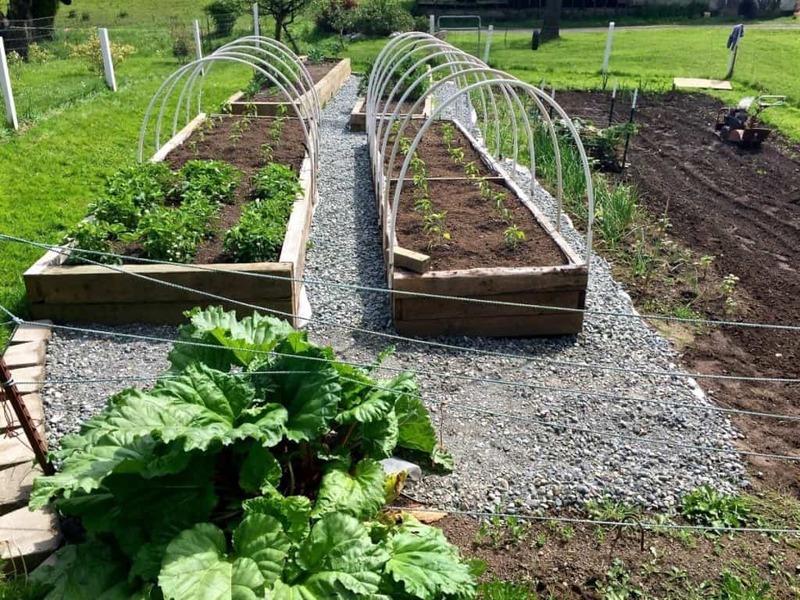 Rhubarb, as with many perennials(like asparagus) requires some patience and a lot of room! Those leaves are big and the stalks get long! Early spring. Rhubarb is one of the earliest crops to get started. My mother gave us this rhubarb start five years ago… I couldn’t say no. She had it wedged into the back of her car with lots of other plant refugees I am honor bound to save whenever she takes a notion. (She has friends that garden). I had tried to grow rhubarb in the past. It started out well, gave us lots of yummy stalks, and then each year became weaker and the stalks sparse and spindly. I just didn’t think it would thrive here. She made me take it anyway. We researched growing rhubarb this time. I found out over harvesting it in the first and second years was a common mistake that weakened rhubarb. OH! Mystery solved. Turns out Growing Rhubarb is a long view operation: Remember! The roots of rhubarb need to grow a LOT in year one and two. Rhubarb devotes most of it’s growth to it’s roots in the first several years. If only one third or less of the stalks are harvested and the plant is well fed, the roots thrive. This produces a robust plant that will give you many years of trouble free rhubarb bounty. Otherwise…spindly weak stalks and an exhausted, dying root. We harvested less than a third of the currently growing stalks only one time, in year two, to help the roots build a strong base. A little more in year three…This year is year five. This crown of rhubarb was divided last year and it’s thriving! Dividing a healthy rhubarb crown after three years of good growth is very good for the crown. Now we have more rhubarb than we can eat fresh. 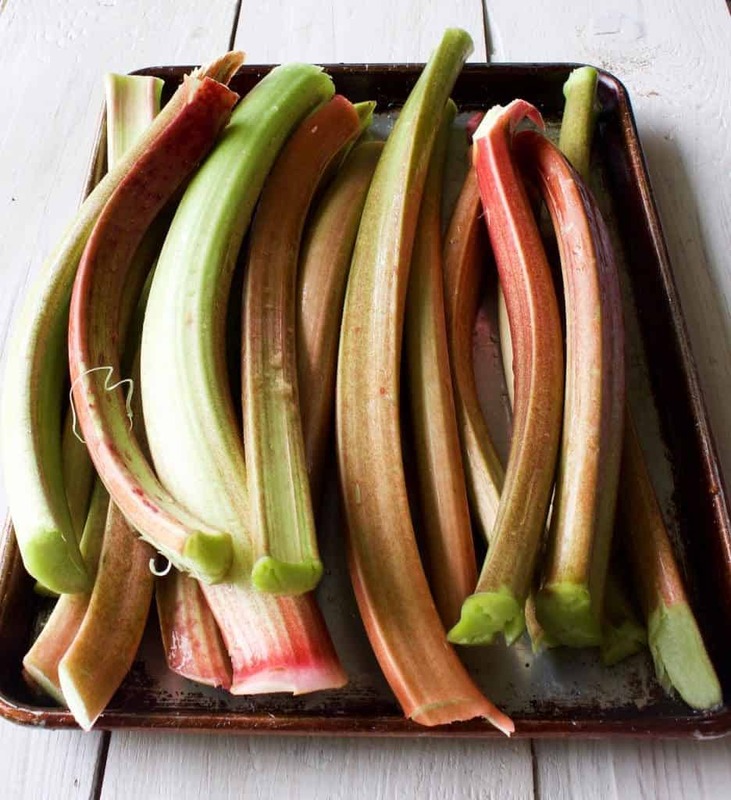 I’m freezing some for later and baking lots of rhubarb goodies in season. Love this piquant veggie. It’s such an interesting flavor to bring into the kitchen. So many ways to use this extraordinary vegetable in either sweet or savory dishes. Strawberry Rhubarb Sauce , Rhubarb chicken, Rhubarb Apple Crisp we enjoy many more delicious rhubarb recipes! Rhubarb is productive in early spring 2016! Here are some tips for planting and caring for your rhubarb. We have only grown Rhubarb from a crown. To grow rhubarb from seed take a look here. 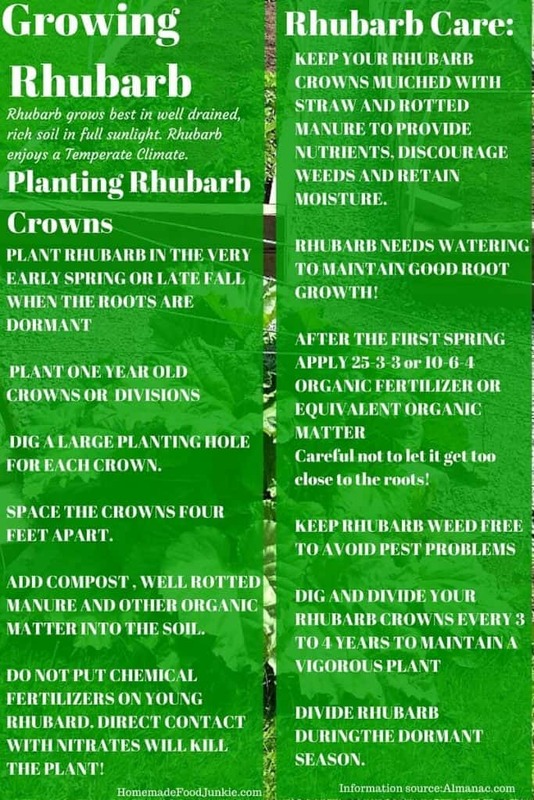 This infographic is a quick guide to planting and growing rhubarb. Be sure to check your zone and local conditions and make sure it’s a good fit for your garden. 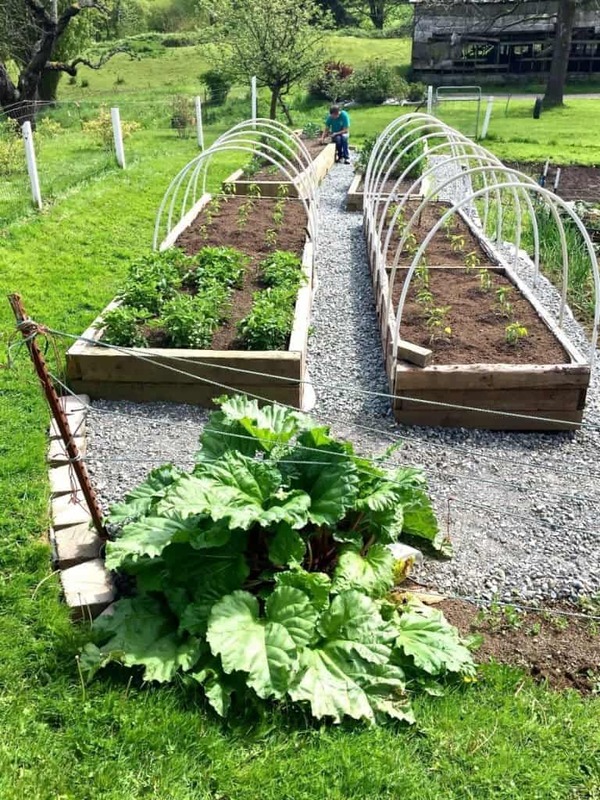 Here is an article on growing Rhubarb I thought you might enjoy. The author is Chris Smith from the Seattle PI. It’s fun to read. Ripe, fresh rhubarb stalks ready for freezing, baking and saucing! So go out and define a permanent area in your garden(or flower bed) for this lovely spring garden treat! Do NOT harvest rhubarb the first year after planting. The roots need a year to grow before they have to support re-growing the stalks. When the rhubarb stalks are thin, stop harvesting. That means the roots need more fertilizer. Your rhubarb roots are struggling to grow the top growth. Over harvesting will kill the rhubarb by robbing the rhizome of necessary nutrients and energy. Rhubarb loves cold early spring weather. If you have a warm spell check to see if your rhubarb plant is sprouting flower stalks. If you find them; just cut them off. Otherwise the plant’s energy is drained into growing flowers, not rhubarb. Leave at least TWO STALKS of rhubarb after harvest. Do NOT eat rhubarb LEAVES. EVER! They are poisonous! The stalk is delicious and nutritious! Cut off the leaves which are full of oxalic acid, which is toxic, and dispose of them. AFTER SEASON’S END remove all the dying plant debris and deeply mulch the roots for the winter! TIME TO ENJOY THE BLOG HOP! Here are our Blog Hop Contributors this week. Enjoy the wealth of experiences here from all over our United States. 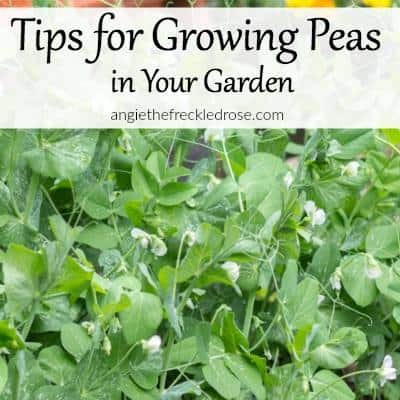 for me since you seem to be pretty knowledgeable about gardening. What are some homemade herbicides that kill weeds without damaging the earth? Hi Elitehort, You may find some help in our post on The Weed Wars. We have used several strategies to combat weeds without pesticides. Hope you find some of them useful. Thanks for stopping by. I love rhubarb, too! I’ve heard some people harvest through the summer if the rhubarb is looking good – do you? I always stop in June, thinking it’s a spring crop, but I wonder. You are never going to believe this but…I’ve never grown rhubarb! I have no idea why, but now reading your post has really made me want to give it a try. That’s one thing I’m looking to change up when rebuilding my raised veggie garden beds. I want to designate at least three of them to perennial crops. 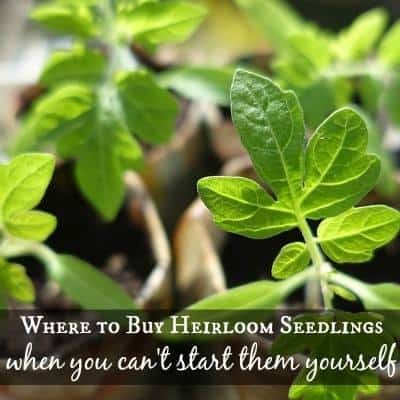 It seems much smarter doing that, especially having such a short growing season. Asparagus, garlic and now rhubarb are all on my list. Space is my only issue. I’m hoping I have enough room to grow what I want. I’ll have to remember to give it a couple of years to grow first. I’ve never heard of rhubarb apple crisp, but now I must give it a go! Definitely pinning for later, and will re-read once I finally plant. Thank you for all of the wonderful tips! Question about your garden fence: The wooden posts I see in the pictures, how far down did you dig for each one? Did you use concrete to make them more stable? And one last question, do you ever have trouble with critters trying to burrow underneath it? Thank you in advance for your help. I’m in the planning stages of all of this, so I want to make sure I do it right! Well Shoot Angie, It’s time to grow some rhubarb! It does not have to be in your garden. If you have a bare spot in your yard that is somewhat protected from fierce winter winds that would work too. My grandma always grew a magnificent rhubarb plant right in her flower beds. We have surprisingly little trouble with critters. Dave actually put the fence in to keep our dogs out of the garden. Our big Sherman LOVES corn on the cob and strawberries. Even green beans and peas, silly dog. He helps himself if he can get at them. The upside of having dogs is the other animals in the neighborhood don’t want to come in close to our house. Deer munch on the fruit trees a bit, but that’s all. Nothing has ever gotten under the garden fence bigger than a mole. Can’t wait to see your new garden plan. Sounds awesome! My family has always grown rhubarb. WE had a plant at our house growing up, my grandparents had one and all of our extended family had one too. I have three in our small garden and I really need to find a home for two of them. They just don’t have quite enough space. These are great tips and your apple rhubarb crisp sounds good. I make a rhubarb custard crisp that we all love. Rhubarb CUSTARD CRISP???? Be still my heart. 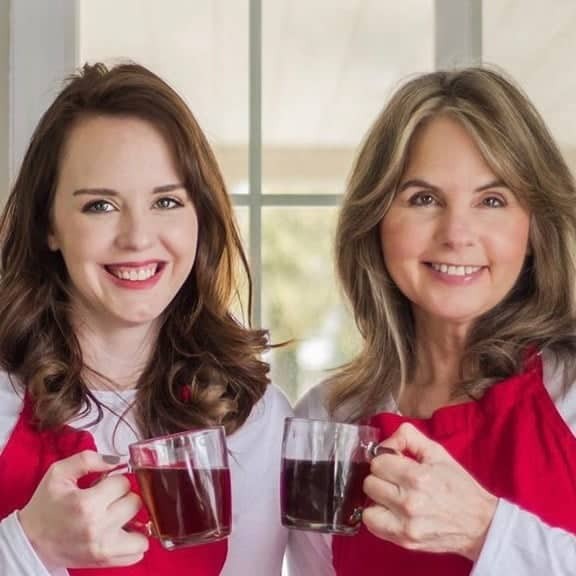 Where can I find that recipe? That sounds so good right now and I have rhubarb in my freezer to use up before the rhubarb harvest begins. I love rhubarb and it seems to grow very well throughout Iowa EXCEPT my garden!!! 🙁 I’ve replanted three years in a row and it keeps dying off. I don’t harvest it the first year at all, so I’m not sure what I’m doing wrong. I haven’t looked at my garden yet to see if it’s come back this year. Need to go do that! Hi Michelle, Hmmm…sounds like our past experiences with rhubarb too. I found this article on growing rhubarb in Iowa for you. http://www.extension.iastate.edu/article/yard-and-garden-planting-rhubarb there is a hotline number to call if you have questions too. Hope that helps. Our garden zone is very different from yours. If you have heavy clay soil it may need amending? That has sure helped us! Good luck! Lots of great information here. My daughter is a big fan of strawberry rhubarb pie and it would be great to be able to grow it. I also like the idea of once established, it will come back again and again. Hi Patty, once you get a rhubarb patch established it is easy. It just needs room to grow, dividing every few years and some compost once in a while. I am so enjoying having rhubarb in my freezer for quick N Easy desserts. Strawberry Rhubarb Pie is a favorite here too! Happy Gardening! Thank you for this great explanation on growing rhubarb! This is my first time trying to grow it and I was nervous because I knew nothing about it. Autumn, Thank you so much for commenting for us. I’m delighted you found this post helpful!